This year for the anniversary of 9/11, dc911truth will present a series of films relatedto the events of September eleventh at Busboys and Poets in Washington, DC from 6 to 11PM.We will be featuring two films, TERRORSTORM at 6pm to be followed by a question and answer session. At 9:11pm we will be presenting the Washington premiere screening of ABLE DANGER.We are also pleased that Sander Hicks, who is the real-life model for the main character of the film, will be on-hand to speak about the film and answerquestions. We had a fantastic fun time spreading the truth to the cheering crowds lining the streets. The one mile parade route was lined with a crowd estimated at over 20,000. The spectators were mostly supportive and we received applause and "thumbs-up" all along the route.We also distributed over 2000 pieces of literature to the crowd including the Rock Creek Free Press newspaper, 9/11 informationcards, flyers and DVDs. 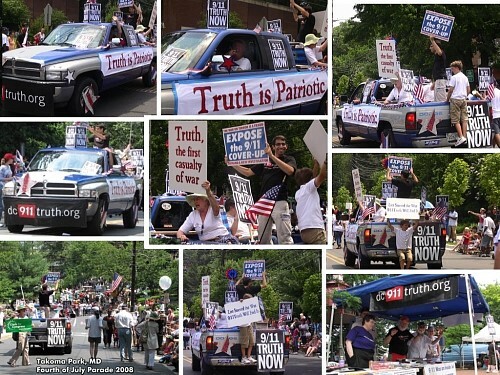 We also had an information booth at the midpoint of the parade where people could buy books, DVDs, bumper stickers, buttons and other 9/11 truth paraphernalia.